​ Beta-glucan is a fibre that naturally occurs in the cell walls of cereals, bacteria, seaweed, fungi and yeast. The health benefit of eating certain species of mushroom has been known in China for more than 2,000 years. In Japan is consumption of seaweed given credit for less breast cancer cases than the rest of the world. ​ Beta-glucan is the most studied natural immune system modulator in the world, and thousands of scientific reports have been published. ​ Beta-glucan has no side-effects when digested and are acknowledged as safe by EFSA - European Food Safety Authority and US FDA - Food and Drug Administration. ​Beta-glucan fibres are made of strings of beta-D-glucose polysaccharide​s. Glucose molecules have six attachment points. In a string is the "1" position of a molecule linked to the "3" position of the next molecule. Those links are called "beta 1,3 D-glucose". ​ The strings can have branches linked to the "4" position or the "6" position of a glucose molecule. 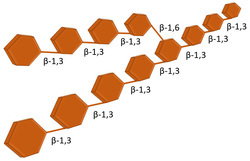 Those links are called "beta 1,4 D-glucose" and "beta 1,6 D-glucose" respectively, and the fibres are consequently called "beta 1,3/1,4 D-glucan" and "beta 1,3/1,6 D-glucan". Beta 1,3/1,6 Glucan can be derived from the cell wall of several species of mushroom, seaweed and saccharomyces cerevisiae, also known as brewer's yeast or baker's yeast. Beta 1,3/1,6 Glucan is regarded as medicine in Australia, Japan (since 1983), South Korea and Taiwan. In Japan is it used for cancer treatment. In Norway do salmon farmers add Beta 1,3/1,6 Glucan in fish feed to minimize the use of antibiotics and other medicines. Beta 1,3/1,6 Glucan is known to modulate the immune system, which means that it helps the immune system to do its job to protect us from pathogens and toxins. This has made beta-glucans very popular as a dietary supplement. ​ Beta 1,3/1,6 Glucan from the cell wall of saccharomyces cerevisiae, also known as brewer's yeast or baker's yeast, is considered to be the most effective immune modulator, because the 1-6 linked branches are longer than those found in seaweed and mushroom. Beta-glucan​s from cereals and bacteria has little or no effect on the immune system, because they do not have the 1,3/1,6 linked branches. Example showing how the purity affects the effectiveness of beta-glucan. Because of increased popularity are there many manufacturers of Beta 1,3/1,6 Glucan products. There are hundreds of dietary supplements containing Beta 1,3/1,6 Glucan, but very few of them are worth the cost. ​ The effectiveness of Beta 1,3/1,6 Glucan depends on its purity and physical properties (sizing and uniformity.) The cell wall of saccharomyces cerevisiae ​contains approximately 20 percent Beta 1,3/1,6 Glucan. The rest of the cell wall are proteins, chitin and a membran. Those impurities must be removed, because they act against the positive effects of the glucan molecules. The effectiveness of Beta 1,3/1,6 Glucan is not linear with the purity, but is rather logarithmic. 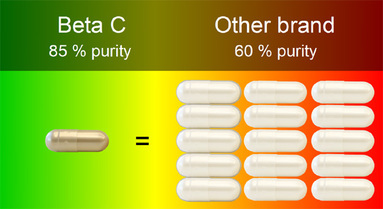 A capsule with 80 percent Beta 1,3/1,6 Glucan may have the same effect as 16 capsules containing Beta 1,3/1,6 Glucan with 60 percent purity. The production cost depends on purity, size and uniformity of the beta glucan. It is considered that Beta 1,3/1,6 Glucan must be at least 80 percent pure to be highly effective. The molecules must also be small and uniform in size to allow them to be assimilated by the immune system. ​ Unfortunately do most manufacturers produce Beta 1,3/1,6 Glucan with less purity and quality. Their motivation is profit. ​ 1) The macrophages digest the beta-glucan and break it down into smaller pieces. ​ 2) The macrophages send signal molecules to other immune cells, which increases their activity. ​ 3) Some macrophages moves to the bone marrow and stimulate the production of immune cells.